SODEM Action hasn't added a story. With the scheduled date for leaving the EU just over two months away, Steve Bray and the Sodem team have really started to up the action. 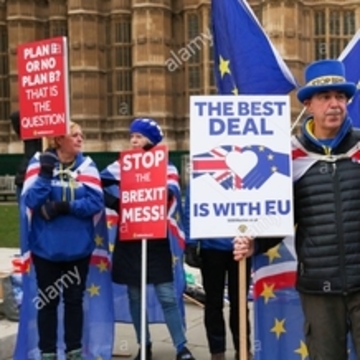 We've got our flags on the early morning news at 7am and have waved placards behind the late evening news at 10pm, as well as the full day stint at Old Palace Yard and College Green. Steve, David, Sue, Elspeth, Duncan, Chris, Ruth, Barbara and Polly (to name but a few) have been working round the clock (often neglecting family and work to keep this going) since mid December to get to Old Palace Yard before the Leave protesters arrive with their copycat protest. How have we done this? Well we rented a house just round the corner from The Houses of Parliament and we've been working shifts and through the night. Having a temporary campaign HQ right in the heart of Westminster has given Steve Bray extra energy and the whole team are able to come togeher, share supper and plan the next day's strategy to keep several steps ahead of the Leave campaign. But it's not cheap and it's not possible to find cheap accomodation within a 5 minute walk of The Houses of Parliament. So we've decided to stick our necks out and ask if you will help us fund somewhere for the team to stay four nights a week. It works out at around £40-£50 a head per night to stay in the house we have found. We know we've asked you before and we know many of you have donated already. Thanks to your donations we've turned this into the most effective, high profile protest on the tiniest of budgets and without any assistance from any of the National Organisations. With success comes more demands and bigger expectations, so we have to ask for your help again. To see us through until the end of March we need £12k (ouch). Every penny you donate will go directly to keeping the protest on the street and highly visible. Contributions are being sought to pay for a temporary base in Westminster for the 64 days to 29th March. Somewhere Steve and the core group can rest, eat and sleep in order to maintain this level of protest. It is also somewhere to store our ever increasing stock of flags, banners and placards. We know so many of you appreciate Steve's incredible commitment over the last 16 months and what it has acheived for the remain movement. You can help with a donation to keep them all going, please give what you can. SODEM Action hasn't posted any updates yet. Polly Ernest is managing the funds for this campaign. The campaign is for a personal cause.